I love art. Not too long ago, I discovered that a huge cache of my stored art was destroyed due to water damage. I was heartbroken. The lost art helped me to realize how much I value and appreciate these very personal collectibles. For example, over the years, postcards, snapshots and souvenir trinkets disappear in crowded drawers, dusty albums and forgotten boxes. But the art remains on the walls and tables, and lingers in my mind. Like the best desert you’ve ever eaten, or your mother’s cooking… you never forget the art. And the more time passes, the more I respect the extra-special and highly personal nature of the art I’ve collected. Fortunately, not all of my art perished. As I look back on it now, I realize that many of the art pieces were collected while traveling. Or, purchased because they depict specific places where I’ve lived and loved. 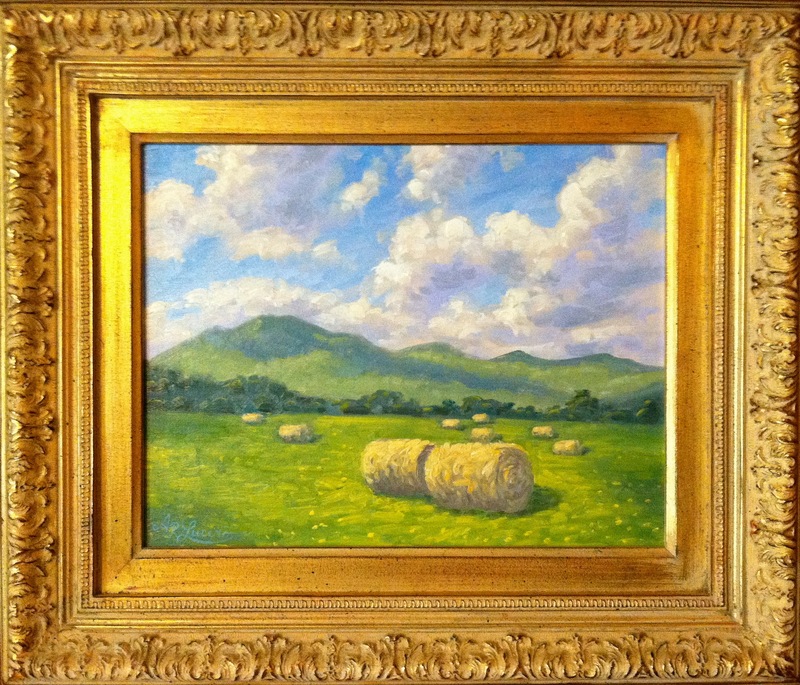 For example, when I first relocated to Virginia from New England, one of my first purchases was a painting of hay bales in a field with the Blue Ridge Mountains in the background… a scene I see everyday here. 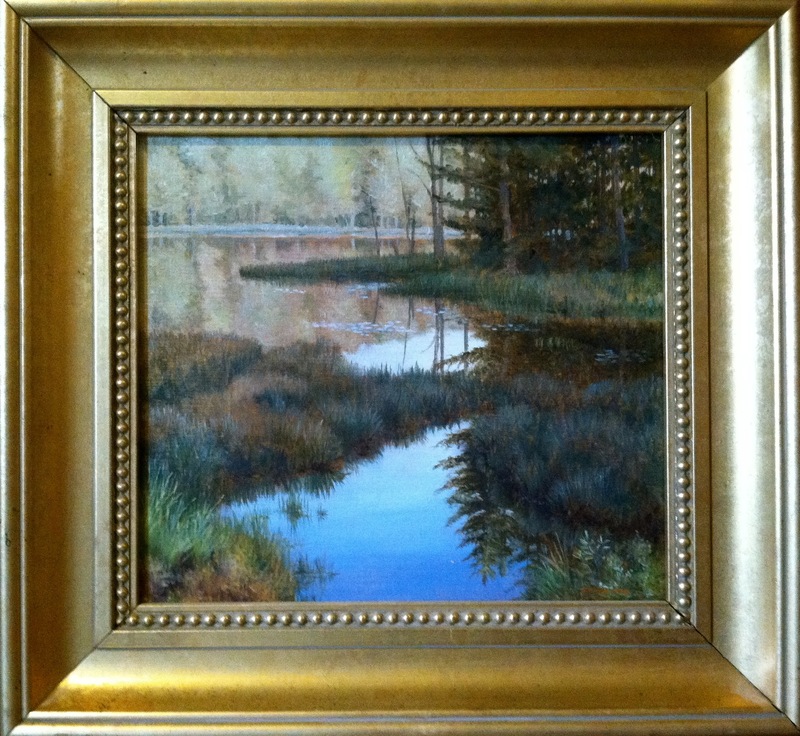 Perhaps, my most favorite piece is a painting of a small pond that was just down the road from my old farm in New Hampshire. 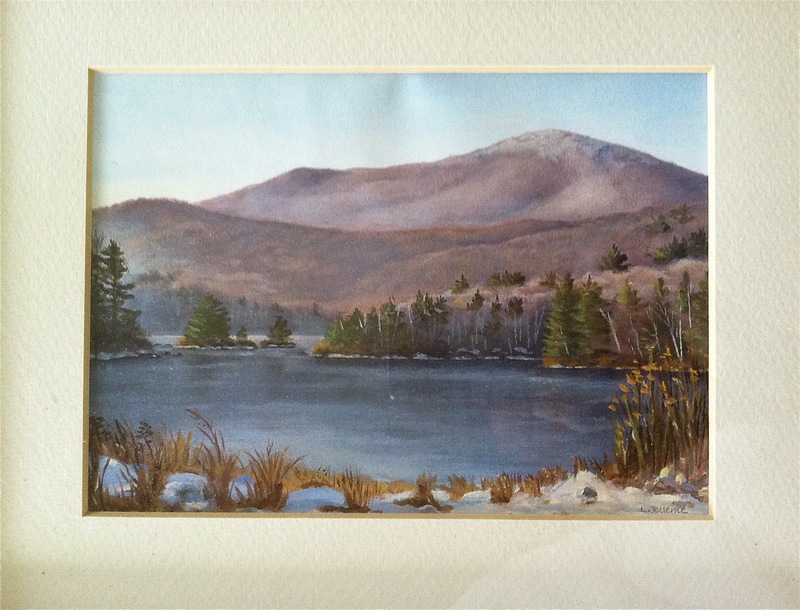 The woman who sold the painting to me loved it as well because she also lived near the pristine pond she called it one of the most peaceful places on earth. The man who painted it lived in a neighboring town. The painting makes me think not only of the place I adore, but also of the people I so enjoyed and miss seeing today. Chatham, Massachusetts, is one of my favorite places in the world. Growing up, I spent my summers in Chatham. Also, as an adult, I lived in Chatham for many, many years. 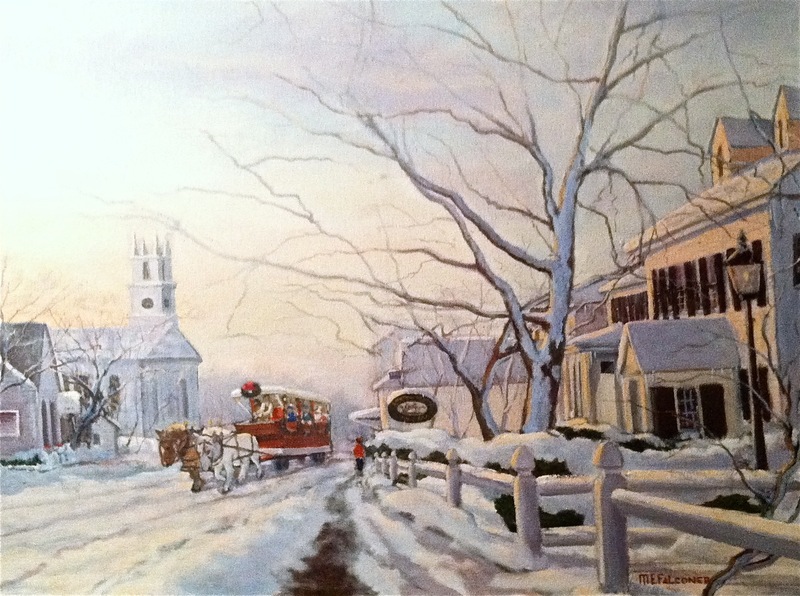 When I was a little girl, my grandmother used to stay at the Wayside Inn on Main Street. My other grandmother, my mother and I shopped, and I modeled as a child, in the Children’s Shop across the street from the Wayside Inn. Every Friday night, my family and I (along with everyone else in town) would enjoy the summer band concerts in the park next door to the inn. I’ve got a print depicting the bandstand hiding somewhere. And for several winters, I worked with my great friend, Nick, who gave horse-drawn hay rides up and down Main Street during special town celebrations. During one particular winter hayride stint, I wore a red jacket as I walked up and down the snowy street alongside the team that Nick drove, wearing his tan overalls. The two horses that pulled the red wagon were Harry (the chestnut Belgian) and Tommy (the white Percheron). Then, one June evening, Nick drove Tommy the Percheron as he pulled the black carriage carrying me to my wedding in the square-steepled church with the clock, just down Main Street from the Wayside Inn. 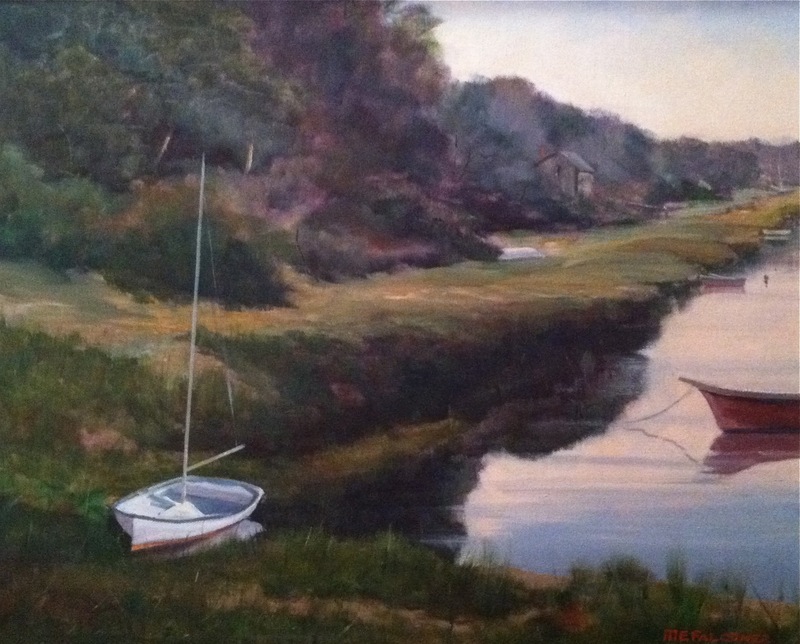 As a child, I spent fabulous Cape Cod summers racing in Stage Harbor in my little white Sprite sailboat. Just last summer, my son and I visited Savannah, Georgia. We were both impressed with the city’s many pristine parks and old architecture. 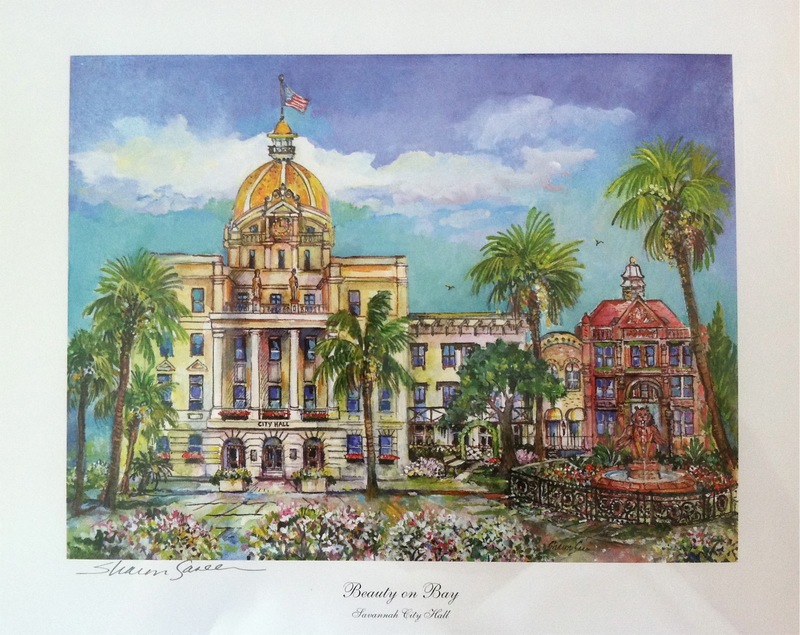 Savannah’s City Hall is gorgeous. In an art gallery alongside the river, I remember how my son and I were having anxious fits as the sales woman took forever to ring-up our two small watercolor prints. She was chatting merrily, on and on… completely oblivious to the ginormous, very black and very menacing storm squall heading down the river toward us. When we finally got our two prints, my son and I ran crazy-fast, racing the storm, to our car parked in the lot across the street. We got to the car just as the raindrops hit the windshield. Before the doors were even closed, the black skies split open with streaks of white lightening. Torrents of water cascaded around us. My son and I laughed with giddy relief as we high-fived ourselves, safe in the car. 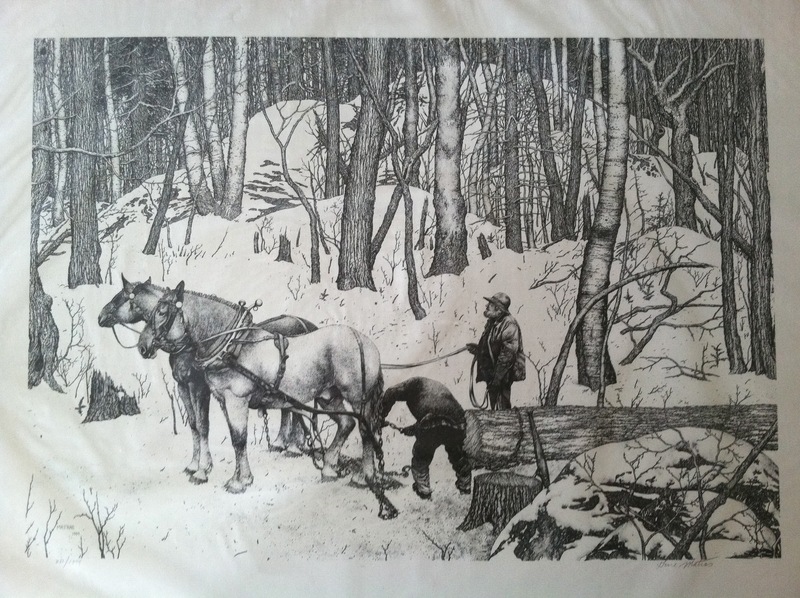 A large black and white print of a traditional logging scene reminds me of winters in New Hampshire and the fair (that my son so enjoyed each year) where I purchased the print. Clearly, I like horses… they keep cropping-up in my art choices! My son’s late father took me on a trip to Quebec City. It was one of just two trips we took together. 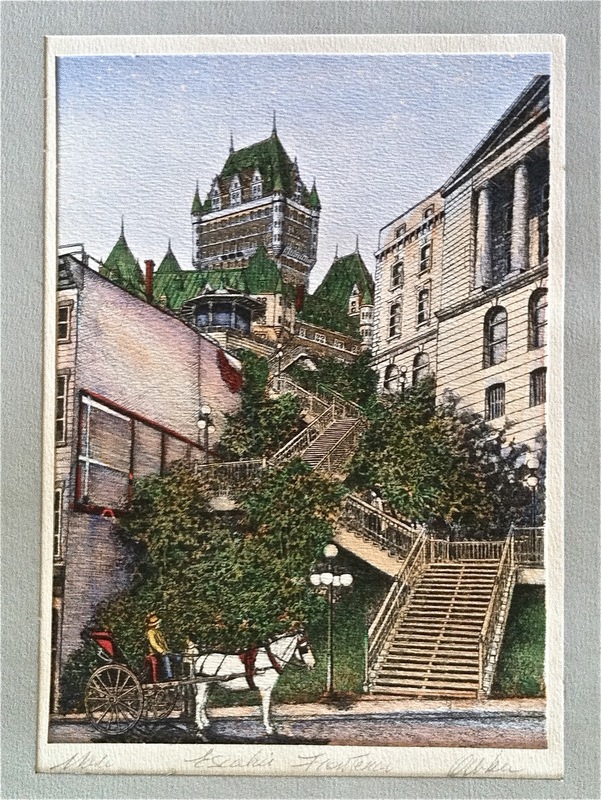 Who can forget the great, famous Chateau Frontenac with its distinctive green-roofed tower overlooking Old Quebec, the marvelous, historic neighborhood of Quebec City? 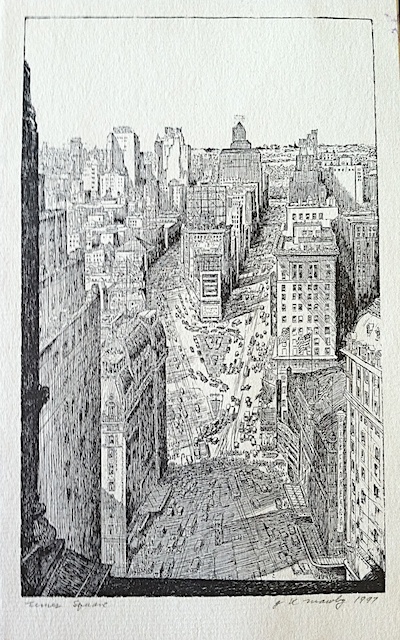 Unlike the sunny scene depicted in my print here, it was a wintry 20-below zero degrees Fahrenheit when we were there! I remember there was snow and ice everywhere and my camera was too cold to work. My favorite places were the restaurants – some of the best food I’ve ever enjoyed – and the marvelous book store with all the books in printed in French. 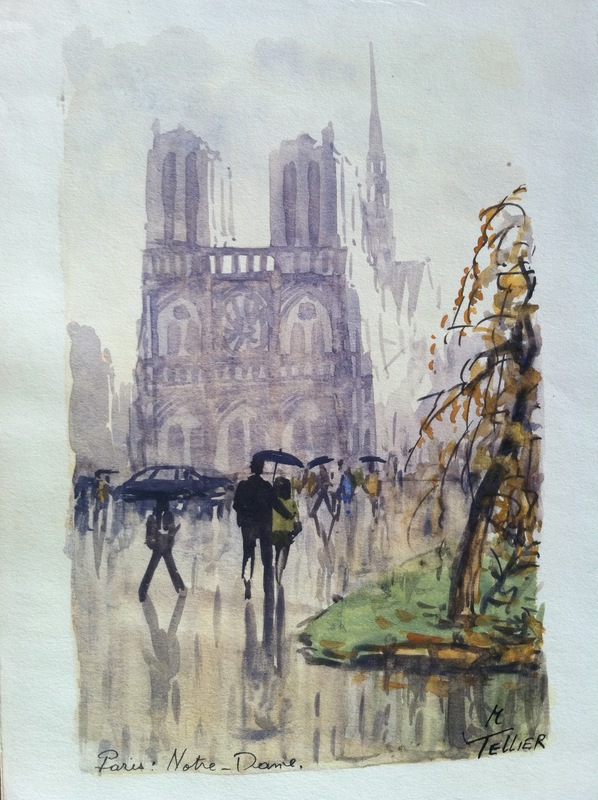 If you’ve ever been to Notre Dame in Paris on a rainy day, you’ll know that this painting is exactly what it looks like outside the great church. I love this little water color for its marvelous atmosphere and simple beauty. Its one of my favorite pieces of art. And, as just an add-on to some other more pricey art purchases, this is one of the least expensive pieces of art I’ve ever purchased. There’s only one Times Square! I grew-up less than 30 minutes from New York City and I never appreciated the city until I moved away. I’d love to live there now. For years, my dad traveled around the world for his work. He even went to China way back in the 1970s (he says an agent from the government came to question him afterwards). 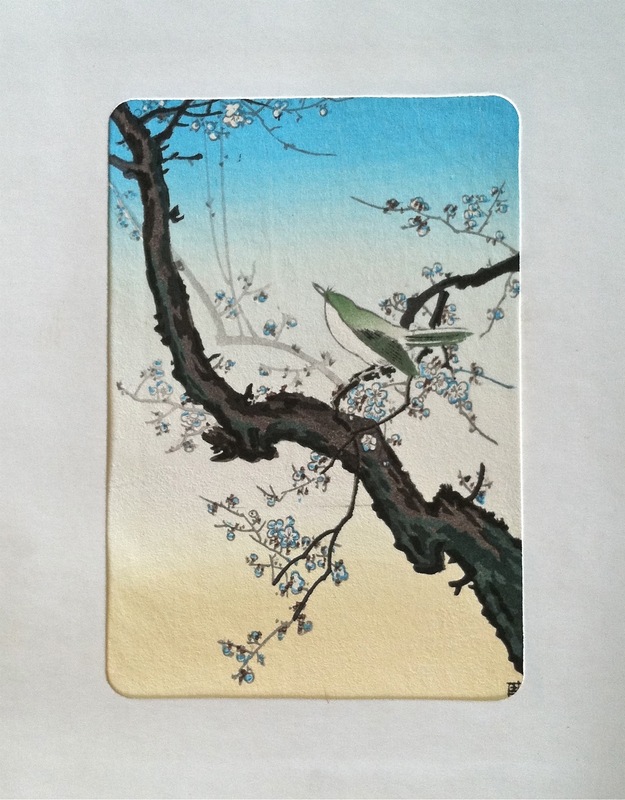 Anyway, he most often went to Japan; and sometimes, he brought back beautiful little watercolors and prints for me. I’m so pleased these works were not lost to the water damage! And I so enjoy them. By comparison, although I have some of his photos and I love photography, I don’t ever look at photos my dad took of his trips… I much prefer the art. When I think about it now, it seems that most likely it was my dad who started my penchant for collecting art while traveling. The best part about finding and displaying art from travels is that friends sometimes catch on. 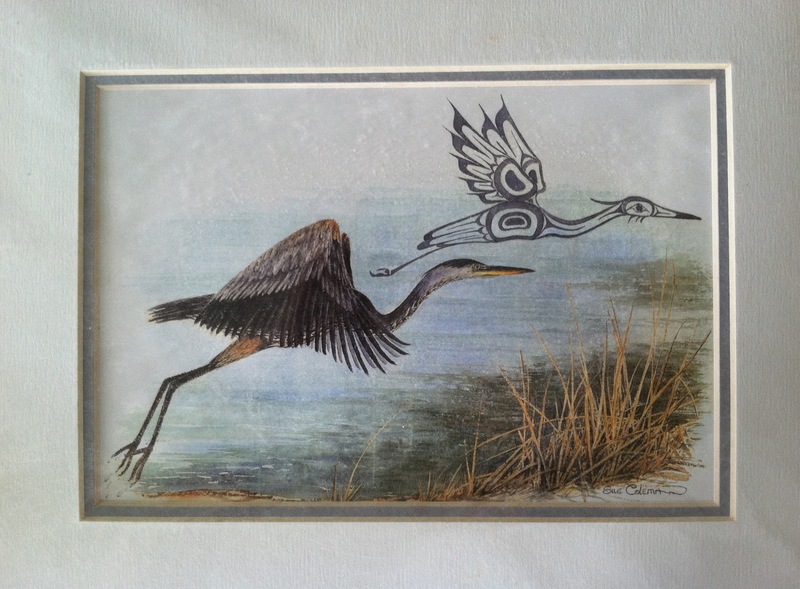 For example, I’ve never been to the Northwest Coast, however, a friend who went to visit her family there brought home a watercolor print gift depicting one of my very favorite birds, a heron. On the back of the print there is information about the artist and her distinctive Northwest Coast Indian paintings. My friend knows how much I enjoy birds, especially herons, egrets and cranes. I consider this gift very special, indeed. 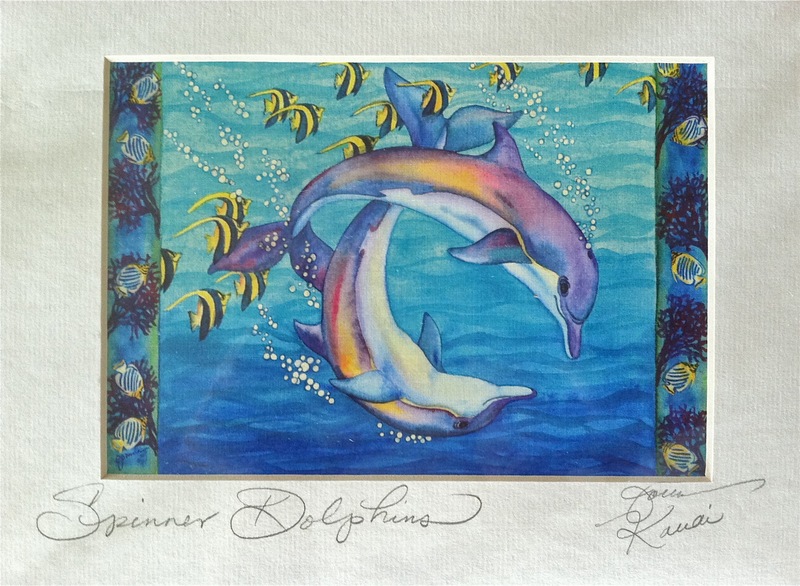 During a family trip to Kauai, my son picked-out a couple of fun watercolor prints. 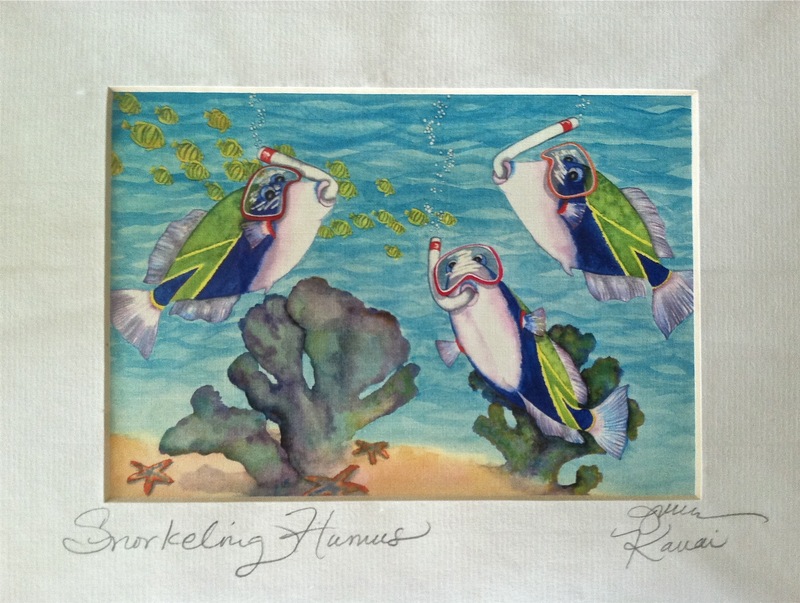 As my son spent weeks chanting, over and over, the Hawaiian fish name “humuhumunukunukuapuaa” (pronounced HOO-moo-HOO-moo-NOO-koo-NOO-koo-AH-poo-AH-ah), finding a souvenir to showcase the most well-known fish of the Hawaiian Islands, and to celebrate my son’s accomplishment remembering such a name, was a no-brainer! Finally, he learned that the fish was “really” just a “common” Trigger fish. He rolled his eyes and shook his head, and was, of course, somewhat disappointed that the fish is really nothing all that “special.” Of course, the family memories it will always bring to my mind makes this little fish very special to me. What precious goodies have you brought back from your travels?